They liked it—You will too!! Custom Service Hardware is a company that believes in providing high quality customer service as much as we believe in selling top notch hardware. We’ve embarked on many collaborations over the years with charities, new businesses, home bloggers, and more. Here’s a look at some of the great projects we’ve contributed our hardware to recently! Nicole from the blog Making It Lovely has a gorgeous Victorian home. We were in touch with her when she was in the early stages of planning floor to ceiling bookshelves and envisioning a rolling ladder. We decided to help her out in the ladder department, and the results couldn’t have been more amazing! The rolling library ladder is so much more than its name these days. You’ll find people installing ladders in their homes, in their businesses, and more due to their aesthetic appeal and great function. 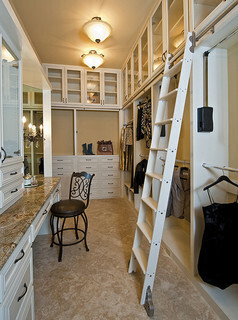 Depending on the amount of space in your home, you could conceivably install a library ladder just about anywhere. Look at all the different ways our ladder hardware is being used below! Contractors love our ladder hardware. It’s easy to install and we offer a variety of custom options. Best of all, our library ladders are manufactured in the USA, making it an attractive purchase for those looking to support domestic production. This rolling library ladder comes with our Quiet Glide technology, which ensures a smooth ride however you need to use it. We had the ladder on display at the International Builders’ Show and created a video to show the ladder in action. The term “rolling library ladder” may conjure up some antique visuals. Ladders rolling on long tracks throughout cavernous library rooms; an old mansion’s designated library with a propped ladder near the shelf. The truth is that rolling ladders have moved beyond the library. The term may still apply to the hardware, but the implementation can be just about whatever you can imagine. While less common in the US, in other countries building up instead of out is more logical. So if you’re thinking of a way to expand that only requires a ladder instead extra square footage, you can save time and money.